The application quality of dry granular fertilizer depends on several variables. In general, the performance of a fertilizer applicator can be contributed to 1/3 operator, 1/3 applicator and 1/3 fertilizer characteristics. When discussing operator and applicator, “operator” refers to the individual operating the equipment and “applicator” refers to the piece of application equipment. Today, accurate placement and rate (or rates in the case of variable-rate application—VRA) during field operation are important for both profitability as well as minimizing environmental risks associated with nutrient management. The 4Rs of Nutrient Stewardship include Right Source, Right Rate, Right Time and Right Place with focus on enhancing fertilizer management. Figure 1. 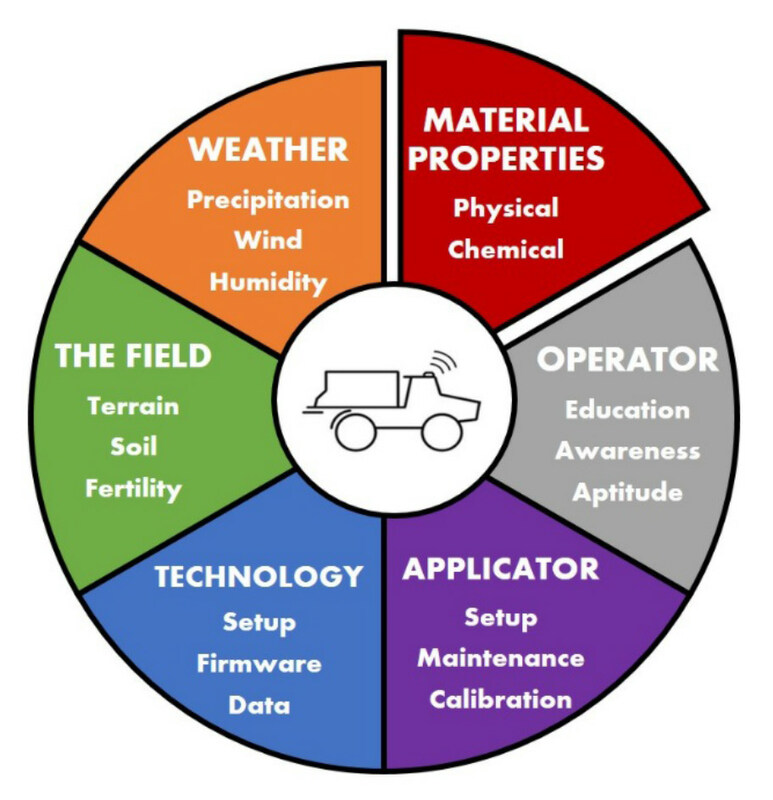 Variables that impact field application of granular fertilizers. Typical values for common granular fertilizers used within cropping systems. When applying granular fertilizer, five considerations should be addressed by the applicator. Understand how differences in the physical properties of granular relate to application accuracy. Know the bulk density (lb/ft3) of the granular fertilizer or blend being used. Know the particle size variation. If a high variation in particle size is present, (fine to nominal particle size) swath width should be reduced to limit particle segregation. Properly adjust swath width for the material being spread. Understand what adjustments must be made to the flow divider, spinner disc speed and fin angle in accordance to the specific material(s) being spread. The physical properties that directly affect the quality of spread of granular fertilizers have been prioritized and listed below. It is commonly understood that particle size followed by particle density are the most impactful factors influencing the deposition of granular fertilizers. Figure 2. Samples of Muriate of Potash (0-0-60) collected from a spreader prior to application. While each sample has the same chemical formulation, note the inconsistency in physical quality. These samples are from two different potash sources. The middle and right samples are from the same source with the right sample containing a range in particle size including dust. The right sample can be difficult to spread uniformly versus the other two samples. A setup change could be required between the left and middle samples to maintain proper metering and distribution. Particle size is a measure of the average granule size normally reported by a single but nominal diameter measurement for an entire fertilizer load or sample. Since particle size varies within fertilizer, particle size distribution indicating the variability in size is normally reported for fertilizers. Particle size and size distribution both have a direct influence on spread width and uniformity. Therefore, two important points need to be understood about particle size in relation to spreading fertilizers. Particle size has an exponential impact on spread width and to the risk of product segregation. In general, larger particles are thrown further by a spreader than smaller particles. Therefore, a wider spread width can be used for larger particles. For an example, a study reported that urea with a particle diameter of 4.7mm can have a spread width of 65 ft whereas urea with a particle measurement of 1.7mm has a spread width of only 33 ft. Secondly, the more variation in particle size within a fertilizer load, the greater the risk of uneven distribution and/or segregation. This is especially true in the case of fertilizer blends. Fertilizer with a wide range of particle sizes, including very small particles, will be difficult to evenly spread with small particles (e.g. dust and fines) landing behind the spreader (assuming no wind). If a blended fertilizer is used, the particle diameters of different products should be within 10% of each other in order to avoid segregation. 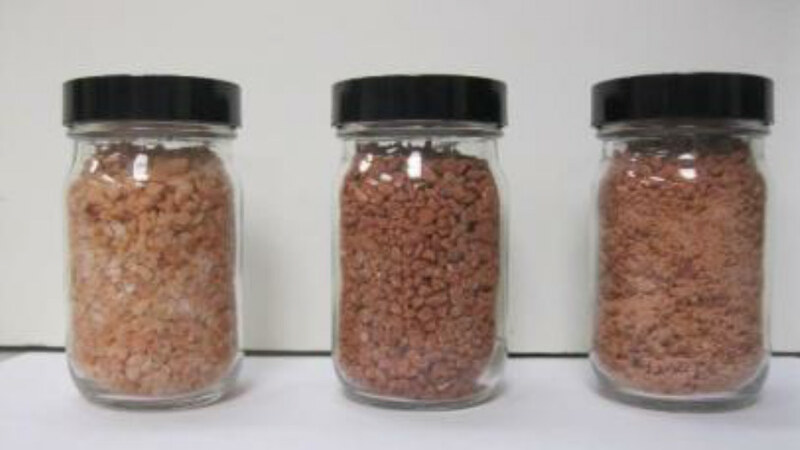 Remember, particle size and size variation can vary for an individual fertilizer (Figure 2) based on source and the handling and transportation methods used. Particle size of fertilizers can be impacted by many factors including transportation, conveyance, handling and metering. These processes can reduce the size of some particles which can increase the particle size variability within a load. There are a variety of metrics used to describe particle size and particle size distribution. Commonly, particle size is reported as the median particle size (d50) or Size Guide Number (SGN) of a sample. Particle size distribution can be expressed using GSI (Granulometric Spread Index) or UI (Uniformity Index) with companies possibly reporting one or both on fertilizer specification sheets. Particle size (d50), GSI, UI or SGN are determined with the use of either the use of sieves or a particle size analyzer. 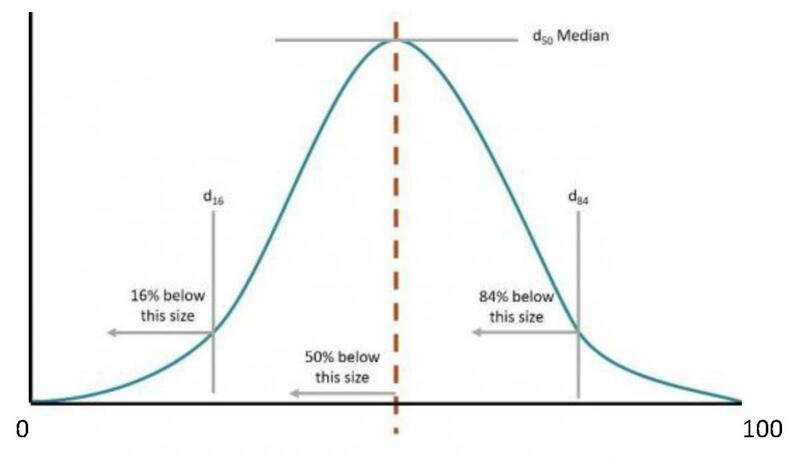 Both processes provide a measurement of diameter size distribution as presented in Figure 3. The following provides information and equations used to compute these various metrics. Figure 3. Example particle size distribution illustrating the d16, d50 and d84 values for a fertilizer sample. d50 is the median particle size for a fertilizer sample or load and the most common metric to report particle size. Units are usually reported in millimeters by most fertilizer manufacturers. SGN (Size Guide Number) values report on the average (not median) particle size multiplied by 100. For example, a fertilizer with an average particle size of 1.5 mm equates to a SGN = 150. Using sieves, once can interpret a SGN of 150 as 50% of particles were retained on a sieve with a 1.5mm opening. One consideration around SGN measurements is when creating a bulk-blend. The SGN can indicate the compatibility of blending individual fertilizer products. Preferred are fertilizer blends having Size Guide Numbers that have no more than a difference of 10. This difference of 10 or less allows fertilizers to be mixed allowing the blend to then be spread as evenly as possible minimizing the risk of segregation. As the difference in Size Guide Number increases, incompatibility increases, leading to high risk of product segregation during spreading. Table 1 provides the following SGN guidelines. Table 1. SGN differences and compatibility for blending fertilizers. Particle Density indicates the mass to volume ratio of particles and is reported as lbs/ft3 or kg/m3. Unlike bulk density, particle density does not include the space between individual particles but rather a measurement of the particle density itself. Beyond particle size, particle density of a fertilizer must be taken into consideration for spreader setup and evaluation of the risk of segregation for blended products. Particle density directly affects the ballistic properties and has a direct impact on the spread width of a fertilizer. More dense particles can be spread wider and can be spread with higher spinner disc speeds. Less dense particles cannot be spread as wide and have the potential to break up under higher spinner disc speeds creating fines and dust. Therefore, as variation in particle density within a sample or load increases, so does the potential of segregation. When considering segregation and trajectory width, particle density has more impact than bulk density. It is best to select materials for granular fertilizer blends that are consistent in particle density to prevent segregation of fertilizer products during spreading. Bulk Density represents the mass to volume ratio of a bulk sample, including the space between individual particles, and is reported as lbs/ft3 or kg/m3. Bulk density is measured by weighing a container of known volume filled with a fertilizer sample. However, bulk density measurements can be reported in a variety of ways so it is important to have awareness of their definitions and which one to use when spreading fertilizer. Bulk density metrics can include “loose” (also referred to as “loose pour”) or “packed” (also called “tapped”). Other density metrics include “true”, “apparent” and “bulk” density (see definitions below). For spreading, Loose Pour or Bulk Density is used within rate controllers or for computing setup. Figure 4. 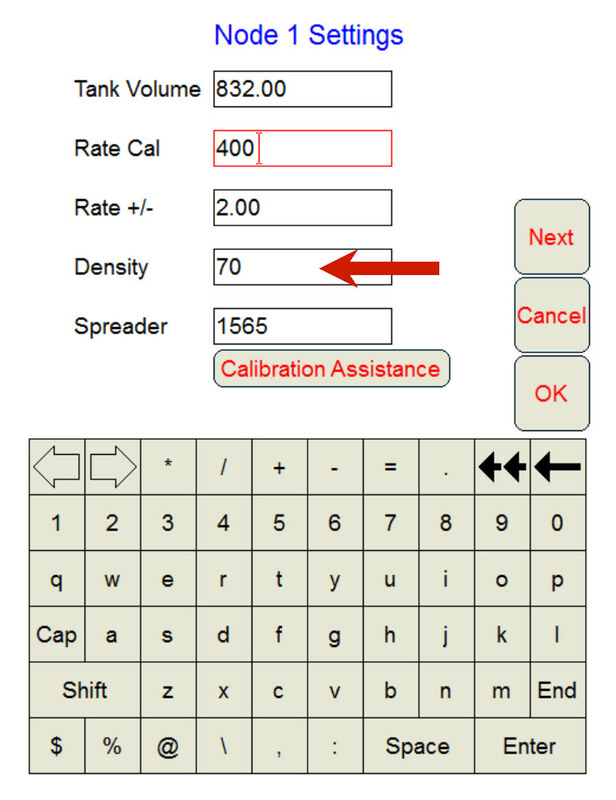 Example rate controller menu screen illustrating the need for a spreader operator to input the proper bulk density for each product spread (Image courtesy of Raven). An important step is to adjust the loose bulk density within the rate controller to ensure accurate metering of product. “Loose” Bulk Density – mass per unit volume of a material after is has been poured freely into a container. ISO 7837:1992 outlines a standard protocol for measurement. “Packed” Bulk Density - mass per unit volume of a material poured into a container followed by mechanically tapping on the container until no further volume change occurs. ISO 7837:1992 outlines standard protocol for measurement. Similar to particle density, if bulk density lacks uniformity, an uneven spread will result. If a rate controller is used when changing products it is critical that bulk density is entered into the spreader setup to ensure accurate metering of the second fertilizer. Bulk density is directly related to product metering since the density is converted into the application rate (e.g. lbs/ac or tons/ac). Therefore, knowing and adjusting for changes in bulk density is important since it is tied directly to the accuracy of product metering and thereby rate applied and agronomic return. Particle Shape can vary among fertilizers. Shapes can be classified as round (spherical or egg-shaped), cubic, rectangular and irregular. Urea and DAP are examples of spherically shaped fertilizers, whereas potash is irregularly shaped. Shape can influence behavior of material during conveyance and distribution. Round particles generally roll along and then off the spinner vanes. Round particles also tend to bounce more when being metered and impacting the spinning disc / vanes. Irregularly shaped particles tend to slide along the vanes, and here the coefficient of friction is more influential on particle dynamics such as exit velocity than is the case for spherical particles. Also, irregular particles are more prone to segregation than spherical particles. The blending of fertilizers with different shapes clearly increase the potential of segregation. However, particle size difference has much more impact on segregation than particle shape. Crushing strength is defined by the International Fertilizer Development Center as the resistance of granules to deform or fracture under pressure (IFDC, 1986). Crushing strength is especially helpful in gauging handling and storage properties of a granular material and determining the pressure limits applied during bag and bulk storage. Crushing strength is expressed in kg/granule for this reason. Hardness or strength can govern the reaction of fertilizers to handling, transportation, storage and application. Particle Hardness measured as pounds force (lbf) or Newtons (N), refers to the amount of force that particles can withstand before rupturing. Crushing strength may be reported, but can also be reported in the form of particle hardness. Storing, transporting and spreading can all affect particle density and particle size of a granular fertilizer Crushing induced variability in these physical properties may increase more in blended than single fertilizers, and problems with fines and dust can occur. Therefore, it is important to factor crushing strength and/or particle hardness so that an even spread can be attained on the field. Hardness directly influences the spread width and operating disc speed. Harder products can be spread wider and used with high spinner disc speeds (>800 rpm). Soft fertilizers need to be spread at slower disc speeds resulting in lesser spread widths. Soft products should be spread at disc speeds below 800 rpm, and the specific speed is determined as the maximum disc speed at which no particle fracturing or shattering is observed. A quick way to measure crushing strength in the field is to apply pressure to individual granules. A simple finger test can be used to evaluate hardness or strength at time of spreading. Granule crushed between thumb and forefinger is “soft”; spinner disc speed usually <700 rpm. Granule crushed between forefinger and a hard surface is “medium hard”; spinner disc speed usually 700-800 rpm. Granule not crushed between forefinger and hard surface is “hard”; spinner disc speed usually > 800 rpm. Flowability refers to a material’s ability to flow under humid conditions, so is an important property to consider during handling, metering and deposition of fertilizers. Flowability can affect the accuracy of metering and placement. More flowable materials can be metered at higher flow rates and their particles will tend not to stick together or bridge during conveyance. As humidity increases, less flowable materials will stick together, making them difficult to meter and evenly apply. Poor flow increases particle segregation and reduces spread width. Flowability in blended fertilizers can impact the product segregation and spread width. The coefficient of friction is the degree of friction experienced between a material and another surface such as spinning disc(s), ground surface, air, etc. A higher degree of friction will result in longer contact with the spinner discs resulting in a larger departure angle and a more uneven spread. The coefficient of friction and particle shape are directly related to how and when a granular fertilizer particle will exit the spreader. The application of granular fertilizers in terms of metering, deposition and distribution are impacted by physical properties of the product. Accuracy of product delivery is critical to ensure that right rate and place are achieved within a field is critical to crop yield and farm profitability. In order of importance, the physical properties that impact the quality of fertilizer granular spread are: particle size, particle density, bulk density, particle shape, crushing strength, flowability and coefficient of friction. A spreader operator and manager should understand how these properties influence spread quality so properly setup and operate equipment for individual fertilizers and maintain acceptable delivery accuracy. This fact sheet was reviewed by Katrina Cornish, PhD, Professor, Food, Agricultural and Biological Engineering, The Ohio State University; Eric Richer, Extension Educator (Agricultural and Natural Resources), The Ohio State University; Curt Woolfolk, Senior Agronomist, The Mosaic Company; and Miles Grafton, PhD, Professor, Massey University. Table 2. Nominal English units for different physical properties of granular fertilizers (note these are typical values for US purchased fertilizers but check for actual values with local supplier). Table 3. Nominal metric units for different physical properties of granular fertilizers (note these are typical values for US purchased fertilizers but check for actual values with local supplier). Alireza Sanaeifar and Mohammad Javad Sheikhdavoodi, 2012. Evaluating of Broadcasting Uniformity of Centrifugal and Oscillating Granular Broadcasters. Research Journal of Applied Sciences, Engineering and Technology, 4(15). Aphale, A., N. Bolander, J. Park, L. Shaw, J. Svec and C. Wassgren. 2003. Granular fertilizer particle dynamics on and off a spinner spreader. Biosystems Eng. 85(1): 319-329. Fertilizer Manual. 1998. Fertilizer Manual (3rd ed.). Ed. United Nations Industrial Development Organization (UNIDO) and International Fertilizer Development Center (IFDC). Norwell, MA: Kluwer Academic. Hoffmeister G., S.C. Watkins and J. Silverberg. 1964. Bulk blending of fertilizer material: effect of size, shape and density on segregation. Agri. and Food Chem. 12(1): 64-69. Hoftsee J.W. and W. Huisman. 1990. Handling and spreading of fertilizers Part 1: Physical properties of fertilizer in relation to particle motion. J. Agri. Eng. Res. 47(1): 213-234. IFDC. 1986. Manual for Determining Physical Properties of Fertilizer. IFDC-G-1. International Fertilizer Development Center, Muscle Shoals, Alabama. The Mosaic Company. 2013. Available at: www.mosaicco.com/images/Diammonium_Phosphate.pdf. Accessed 10 June 2013. Smith, D.B., M.H. Willcutt, J.C. Doller, and Y. Diallo. 2004. Uniformity of granular fertilizer applications with a spinner truck. Appl. Eng. Agri. 20(3): 289-295. United Nations Industrial Development Organization (UNIDO) and International Fertilizer Development Center (IFDC) (Ed.). (1998). Fertilizer Manual (3rd ed.). Norwell, MA: Kluwer Academic. Virk, S.S, D.K. Mullenix, A. Sharda, J.B. Hall, C.W. Wood, O.O. Fasina, T.P. McDonald, G.L. Pate and J.P. Fulton. 2013. Case Study: Distribution uniformity of a blended fertilizer applied using a variable-rate spinner disc spreader. Appl. Eng. Agric. 29(5): 627-636. Yildirim, Y. 2006. Effect of vane number on distribution uniformity in single-disc rotary fertilizer spreaders. Appl. Eng. Agri. 22(5): 659-663.